Apple certainly made a splash with the release of Siri, even though it is in some sort of beta flavored flux. With nothing quite like it out there on any other device, and the decision to limit its availability to the new iPhone 4S, Apple both gave a reason to upgrade to iPhone 4 owners, and made the competition sit up and take notice at the same time. Since the iPhone 4S’ release, every hacker, tweaker and, well, let’s just say a lot of people, have been trying to get Siri to run on iDevices that do not bare the ‘4S’ moniker. They have proven that it is indeed possible, but with Siri needing to speak to Apple’s servers and the accompanying authentication that requires, we’ve not seen a real port as yet make its way into the public domain. Now though, we can get half of the Siri experience thanks to a jailbreak tweak by a developer called Eric Day. The app, rather inventively called Siri0us – why there is a zero in there we’re not really sure – is available to download from Cydia right now, and costs nothing so long as you don’t mind a few ads here and there. So, what does Siri0us offer owners of iDevices that don’t normally get the Siri love? Well, while actual Siri integration is not present due to legal issues that have prevented others from releasing it, the tweak does bring the Nuance-powered dictation feature to the masses. 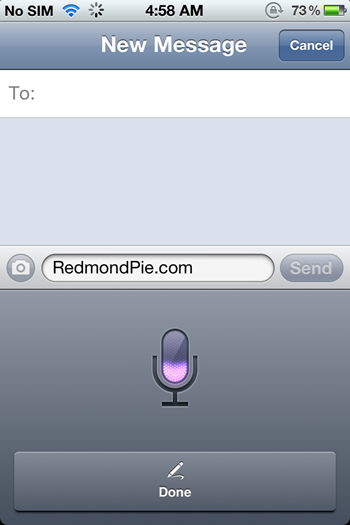 Siri dictation for your iOS 5 devices. No iPhone 4S keys/files required. As Jeff at iDownloadBlog has shown in this video, the tweak does indeed work, and if you’ve been waiting to talk to your iPhone but don’t want to spring for an iPhone 4S, then chances are you’ll be pleased as punch with what is on offer here. In order to install Siri0us you’ll need to add the http://apt.if0rce.com repository to Cydia and search for the app by name. One word of warning – some users have reported issues when trying to install this tweak, and if you’re device keeps on respringing there is a fix at hand. We’ve had confirmation that this does indeed work fine with the iPhone 4, iPhone 3GS and some iPod touch units, though with this tweak being so new, your mileage may vary. You will obviously need to have a jailbroken device to get it to work. For jailbreaking iOS 5 tethered using Redsn0w, you can follow our complete step by step guide posted here, or here if you want to use Sn0wbreeze on Windows. Since jailbreak on iOS 5 is currently limited to tethered boot only, you can install ‘SemiTether’ patch (instructions here) from Cydia to make your jailbreak semi-tethered on iOS 5. For those of you on iOS 5.0.1 can follow our instructions posted here on how to jailbreak using Redsn0w, or here using Ac1dSn0w, or here using Sn0wbreeze.